Presenting the fine beauty of Mughal Painting for your personal Indian Miniature collection which will shine with the addition of this unique Mughal Artwork. This artwork is truly a miniature and you will have to use a magnifying glass to appreciate all the details. The Mughal emperors were a great patron of the arts. Under their enlightened and spirited rule Mughal India embraced the cosmopolitan influence of Persian, European and Indian styles. 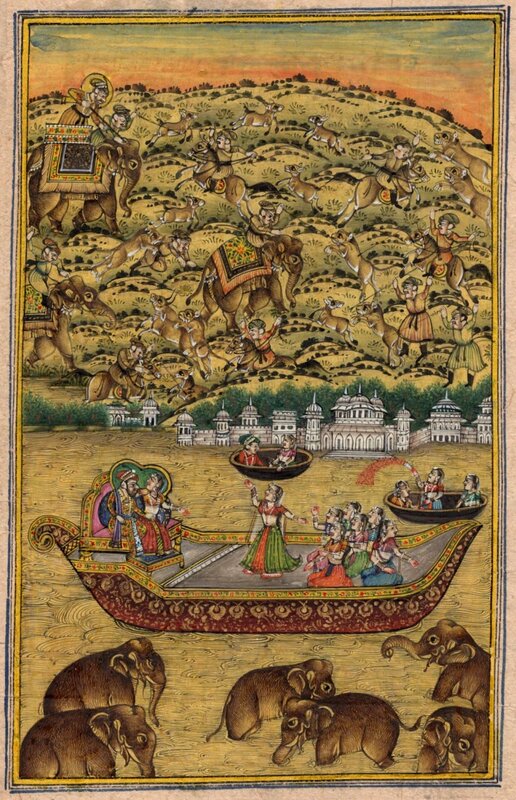 All of which are to be seen in this image of the emperor astride an elephant, surveying the scene of his hunting triumphs, as well as enjoying his harem boat ride against the background of the lake palace. The narrative is captured in the jewel-like detail, the bright and engaging colors, the delicate strokes and the delight in beauty. Typical of the Persian influence in Mughal art are the luminous greens which contrast so richly with the metallic grey of the elephant; the use of relative scale to convey the significance of the subjects; and the interlocking hills interspersed with figures that delineate a kind of perspective. Only one piece in stock. Buy this Mughal miniature painting for your collection before it is gone.